The story of Point Travels and Tours is told in tandem with that of Point Trading Private Limited, which began humbly from its incorporation on 19th September 1994 in the business of pharmaceuticals. Since then, over the past two decades, Point Trading has expanded and diversified into various conventional commercial activities and industries, most prominently that of the pharmacy business activities. Most evident is that of the successful “Point Pharmacy” boasting 14 branch outlets selling medical equipment and supplies, alongside Point Chemist and GSH Pharmacy. Additionally Point Trading also expanded itself circa 2014 into the local IT industry with Point IT, and also that of Point Collection, focused on baby ranged apparels and merchandise. 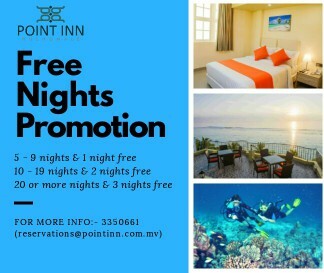 In recent years, Point Trading looked to the prided travel and tourism industry of Maldives, and as such, on 5th July 2007 we began our venture of Point Travels and Tours Private Limited—which was enhanced later in 2016 by the advent of Point Inn and Point Café’, serving the tourists and travelers to the Maldives. Although owned and managed by the owners of Point Trading, the aforementioned tourism and hospitality ventures operate independently, with its own modus operandi and product portfolio. Point Travels and Tours prides itself with the wide array of services offered to the paradise-on-earth seekers. From diving, snorkeling, various watersports, island hopping excursions, health based spa activities and not in the least, romantic dinners and getaways—we’ve got it. The mission and vision values of Point Travels and Tours Private Limited is symbiotic and synonymous to that of the general values of Point Trading and all its’ ventures. Our mission is to achieve value added growth by ensuring the utmost satisfaction of our clients and other key stakeholders. Success, we believe, lies in being loyal to our principals and partners by having common targets. To this end, our directors and employees work exclusively for the Point ventures, compromised by involvements in any other private or public sector establishments. We strive to attain and sustain such values in all of the industries we operate in, day in day out.